Have the ZROCK2 for more than a month now and I'm amazed each time I listen using it. It does somehow enhances the bass without taking away anything from the music in my set-up. I have it hooked up to my headphone amp. Desktop PC and PS4 goes into the DAC, DAC goes to the ZROCK2, and that goes into my headphone amp. It works pretty damn well as compared to the cheap chinese tone controls I was trying out previously. The bass and body of the music is greatly improved on my HD800S without impacting its impressive soundstage, and thus brings out full potential of my headphones in my opinion. Great to hear. . . . I have my ZROCK2 feeding my SE84UFO3-25 Monoblocks, but my headphone amps are fed directly from my ZBIT (I have a ZBIT with two stereo outputs, one goes to the ZROCK2 and one to my Taboo Mk IV. The Taboo Mk IV sounds fantastic and doesn't really need to have the EQ tweaked by the ZROCK2 the way that the Monoblocks do for the HR-1s. But soon I'll be swapping that out for the CSP3-25 and using that to feed the Monoblocks, so I'll have the ZROCK2 in the chain before hand as one possible configuration. Will be fun to listen and experience. I love the ZROCK2. A great addition to a system. 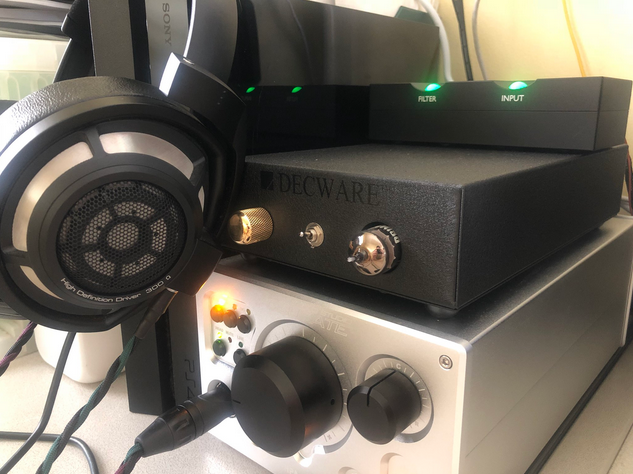 I am feeding the CSP3-25 with the ZROCK2 and the CSP3-25, with dual stereo outputs, is feeding the SE84UFO3-25 Monoblock amplifiers (driving the HR-1s) and the Taboo Mk IV (driving Audeze LCD-2 primarily). I'm getting heavenly sound, and in part it's because I've fallen in love again with the Amperex 6085 tube and am using it in the ZROCK2 and the Taboo Mk IV. Turning the gain a little bit more down on the Monoblocks makes this work admirably with the HR-1s and riding the gain between the CSP3-25 and the Taboo Mk IV makes amazing deep and wide sound with the Audeze LCD-2. I'm trying to remind myself that I don't need to roll any more tubes. Amperex 7308 are in all the positions of the CSP3-25 and the input positions of the Monoblocks, Amperex 6DJ8 are in the ZTPRE, SV83 are the output tubes for the Monoblocks and the Taboo, Sophia Electric Aqua 274B are the rectifiers in the Monoblocks and the CSP3-25 and an Arcturus Type 80 Globe is the rectifier in the Taboo. The Monoblocks have the stock OC2 underneath the chassis and Raytheon OD3W on top. Great tubes all working so well together.